Horreya Hotel, 14 Horreya St.
Local hotel restaurants and bars in Cairo are often overlooked by Cairenes. Instead, much of the city’s nightlife contingent find themselves frequenting more reputable establishments, when in fact they can have the same thrills at half the price. Pleasantly secluded in a Heliopolis side street, Horreya Hotel is home to a café and bar high up on the 8th floor. 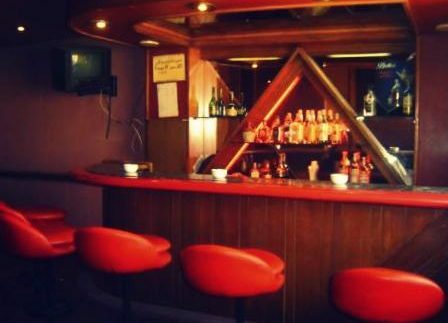 Taking a seat inside, you might feel like you’re in a disco scene in a 70s Egyptian film; the walls are coated with polished engraved wood and the bar is lined with eclectic-red barstools – a colour also used for the curtains. Unfortunately, the old school vibe is killed by an LCD screen hanging on the wall. In the summer, regulars tend to favour the breezy outdoor terrace for its tranquil rooftop view. Since this is a hotel, expect hospitable treatment from the staff, all of whom don white shirts and black trousers. Since most of the patrons head to the bar for a casual beer (17LE) and smoke, don’t be surprised if you’re not brought a menu without asking first. Interestingly, the menu has a vegan section – a rarity in Cairo. Our waiter informed us that the section was added due to popular request by foreign guests staying at the hotel. Being Cairenes, we lean more to the carnivorous side, so we skipped the curry rice for something meatier. For starters, we ordered Dauod Pasha meatballs (18LE) and a taboula salad (9LE), followed by chicken alfredo pasta (23LE) and an Om Ali (15LE) for dessert. Since our visit was on a week day and Horreya was a little empty, our meal was served in less than half an hour. First up on our table were the meatballs and taboula. Peculiarly, the meatballs were served without any sauce, presented on a bed of shredded carrots. Nibbling the small portions off of toothpicks, the dish was disappointingly cold and bland. In contrast, the taboula salad was perfect; served in a clay oval dish, the veggies were well-cut and crunchy, and the dressing was nicely seasoned. Shortly afterwards, we were handed a gratifying dish of alfredo pasta. The steaming pool of thick, white, creamy sauce was teeming with fettuccine, chicken strips and the occasional tuft of mushroom, and it all tasted as great as it looked. It was so good in fact that we decided to use the sauce as a dip for the meatballs. Whilst forking our last string of pasta, our waiter returned to present us with the Om Ali. The traditional treat looked a little off at first, as it was sprinkled with icing sugar, but digging in proved our doubts to be misplaced. The chunky pastry was moist without being soggy and its flavour rang through our taste buds, since the chef had been kind enough not to over-sweeten it. It was certainly much better than the Om Ali served at fancy Egyptian weddings. In a neighbourhood has only recently become more receptive to nightlife, Horreya is great for evening hangouts with friends. Heliopolis residents can enjoy a rooftop view and an affordable dinner and drink without having to cross 6th of October Bridge. Affordable food and drink in a casual setting. Some of the dishes lack in areas.